Chou’s 13F portfolio increased from $262M to $270M during the quarter. 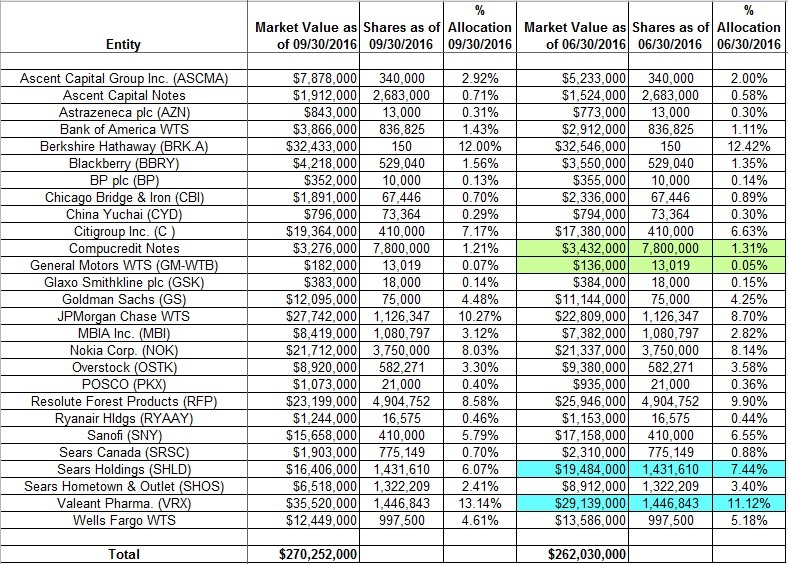 Valeant Pharmaceuticals at 13.14% of the portfolio is the largest position. 1. Valeant Pharmaceuticals (VRX): VRX is a 13.14% portfolio position established in Q1 2016 at prices between $26 and $102 and increased by ~48% last quarter at prices between $19 and $36. The stock currently trades below those ranges at $17.84. Note: VRX price dropped ~12% yesterday following a Bloomberg report that the former CEO and CFO of Valeant are the focus of a criminal investigation by US authorities. 2. Sears Holdings (SHLD): Sears (SHLD) and its spinoff entities Sears Canada (SRSC) and Sears Hometown & Outlet (SHOS) are together another large presence at a combined 9.18% of the portfolio. Sears is a long-term position that has been in the portfolio for well over a decade and their cost-basis is high. Last quarter saw a ~39% increase at prices between $10.70 and $18.65. The stock is now at $11.11. 3. 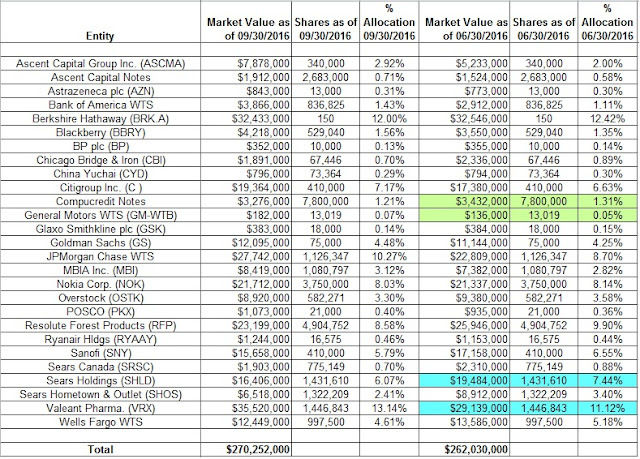 Berkshire Hathaway (BRK.A): The 12% portfolio position is the largest 13F equity stake. The last major activity was a 50% reduction in Q1 2016 at prices between $187,000 and $214,000. The stock is now at $215,700. 4. Resolute Forest Products (RFP): The 8.58% RFP position has been in the portfolio since 2010 (Abitibibowater at the time) and the cost-basis is much higher compared to the current price. Q2 2013 saw a one-third increase at prices between $13 and $16. The five quarters through Q1 2016 also saw a ~20% combined increase at progressively lower prices between $4 and $19. The stock is now at $4.75. 5. JPMorgan Chase Warrants (JPM-WT): The 10.27% stake in JPMorgan TARP Warrants was acquired in 2011 and the price has almost doubled. The position has remained relatively steady since. Chou is sitting on large long-term gains. 6. Nokia Corp (NOK): NOK is a 8.03% stake that has been in the portfolio since 2009. The bulk of the current stake was purchased in Q2 2012 at ~$3 per share. The stock is now at $4.48.